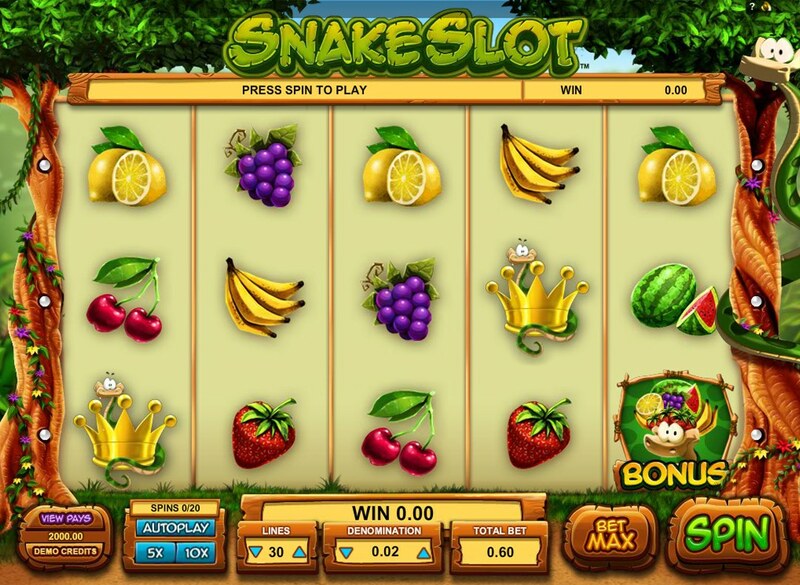 Jungle and fruit – two themes that do well by themselves in online slots, but when combined form the backbone to some of the most popular slots around. Mega Moolah, anyone? Nuff said! With some tasteful graphics, dashes of color and a nice Jungle Book-esque jazz track playing over the top, Snake Slot – the 5 reel, 30 pay-line slot from Leander Games – could well be Mega Moolah’s scruffy younger brother. Down the side of the screen during base gameplay you’ll find the titular snake who looks on as you spin the reels and hisses approval whenever you hit a winning combo. This is a ‘snake’ slot after all, so the Snake symbol on the reels actually acts Wild, substituting for all symbols other than the Scatter and Bonus symbols. Five Wilds across the reels awards you 4,000x your line bet. Three Free Spins Star Scatters on reels 3, 4 and 5 triggers free spins. You’ll receive 10 straight spins with another 10 freebies up for grabs if you hit another three Free Spins symbols. Three Bonus icons on reels 1, 3 and 5, meanwhile, triggers the ‘Jungle Party Bonus’ feature. Essentially a Pick Me Bonus style game, you get to select fruits for the snake to eat – different fruits award different amounts - so five melons, for example, pays out 400x your bet. Finally, hitting the Snake on reel 5 triggers the ‘Snake Lucky Line’ feature. Here you’ll earn a straight win of 2x your total bet, and a random pay-line will be selected with a Wild plonked at the start of the line. You’ll get two re-spins, and the Wild appearing in that first reel substitutes for all symbols during your two free spins. Yes, all – not just the Scatter and Bonus. 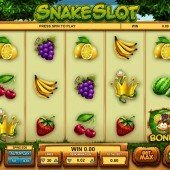 Quick and fun, with some jolly music and the classic fruit symbols (I’m a sucker for old-school fruit symbols) Snake Slot should cater for those who love the feel of Mega Moolah. The Lucky Line feature is a neat twist as well, and I found it being triggered fairly regularly.